Congratulations! You’re about to receive a proposal of marriage from the love of your life and your best friend. It’s a happy time but also pretty stressful for the person who is proposing. Will you say yes? Will you love the ring? Think about it: it’s a huge purchase and yet it’s traditionally made by one half of the happy couple. But you can help relieve the stress (and also make sure that you also really honestly love the ring so your happiness doesn’t have even the tiniest bit of regret) by letting your partner know what kind of engagement ring you like. 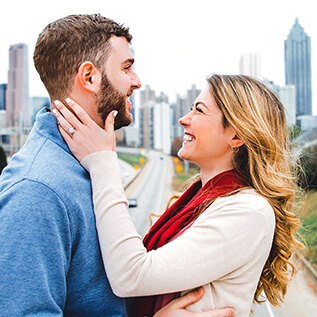 That helps to remove a lot of the stress of choosing for someone else and lets your love focus on making the proposal romantic and memorable. Are you two completely open about everything? Go ahead and make your ring preferences known. You can shop and pick out your engagement ring together. Want to make sure you don’t spoil any of the surprise? Then you need to practice the time-honored art of the engagement ring hint. 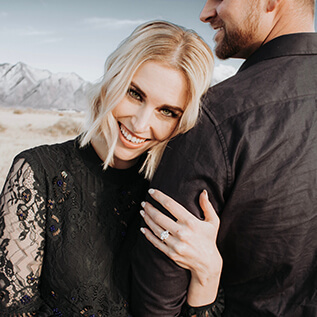 Here are four sure-fire ways you can make sure your spouse-to-be knows your taste in engagement rings. Each hinting method has a subtle and not-so-subtle version, depending on your comfort level (and the relative obliviousness of your intended to hints.) Exercise your best judgment on whether your message is being received! You’ll read lots of hint articles that tell you to leave magazines open to ring ads around the house. But today you can save some trees and just go to image heaven: Pinterest. Pinterest is the perfect place to save images of the exact ring you want, with helpful links that go directly to the place to buy it. Done! Here’s how to use Pinterest for subtle and not-quite subtle hints. Last year my sister created a wish list with all the things she really wanted. A Tesla. Balenciaga sneakers. Two carat diamond studs. We all thought it was hilarious and proceeded to buy her the usual perfume and sweaters. Go ahead and make your own sky’s-the-limit wish list. Hey, a girl can dream, right? Include that dream ring (with your ring size in the notes.) Let your partner know you had this hilarious idea. Guaranteed he’ll look. Create an engagement ring wish list with a few options. You can even send your partner a link. Or just go ahead and pick out the one ring you really want and send the specific link. RockHer has a hint button on every engagement ring product page for just this reason. 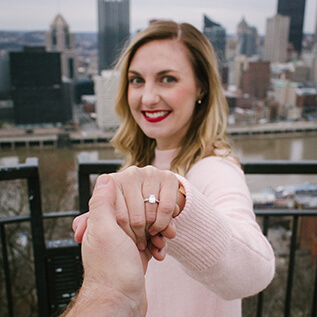 Doesn’t it seem like everyone you know is posting engagement ring selfies on Instagram? Make sure you follow RockHer and you’ll have an endless stream of gorgeous sparkle to drool over. When you see a post with the kind of ring you want, you have the perfect platform for an engagement ring hint. Go ahead and compliment your friend on the perfection of her ring. Then congratulate her and her partner from you and your partner, tagging him in the comment. Mission accomplished. 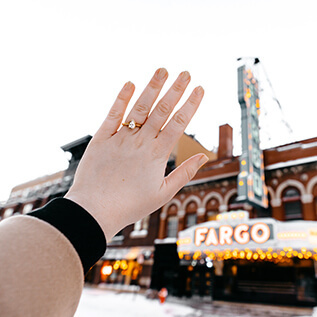 Follow your favorite ring designer (ahem, like RockHer) and when you see the ring you want tag your partner with a wistful “someday” or a saucy wink and your size. You know how when you shop for shoes and then that exact pair follows you everywhere you go online for weeks afterwards? You can use that to subliminally show him the engagement ring you are stalking. 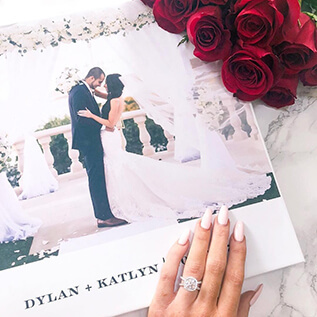 Visit your dream engagement ring (like this one) and wait for the ads to appear when you are reading a news article, watching a cute cat video or checking Facebook. Then show your partner the page with the ad. Repeat a few times to make sure your message is received. Borrow your partner’s laptop (maybe because you're backing yours up), visit your favorite ring. The ads will now follow your partner around. Brief your friends on what you want, what you don't like and your ring size. You can even send them a link to your favorite ring so they are prepared. Go ahead and tell your partner that you admire your friend’s taste and say: “if you ever need advice on buying something for me, ask her because she always knows exactly the right thing.” Then make sure she does! Your dream ring will be on its way pronto.